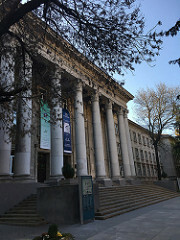 The University is named after Angel Kanchev, a 19-century Bulgarian revolutionary who committed suicide at 21 in Rousse after having been betrayed and his attempt to join the Bulgarian revolutionaries in Romania failed. The university was established in 1945. At the time it was the one and only higher technical school in Bulgaria outside the capital city of Sofia. This was the result of the efforts of local intellectuals to decentralize the educational system in the country. Back then, before the land nationalization and the consequential end of the private sector in Bulgaria had been initiated by the Communist government, the urban working class was just emerging and the country was primarily depending on its agriculture. Hence, the initial agricultural and mechanical engineering specialities at the university. Nowadays, the scope includes Law, Business and Management, Public Health, Natural Science and Education. 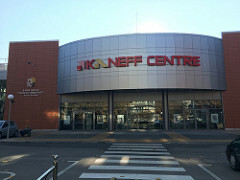 One of the nation-wide initiative held at the University is the RuseConf. A relatively new event with its first release in October 2014, it brings together leading Bulgarian IT specialists as part of a free conference on cutting-edge programming technologies and coding. When talking about the University of Rousse, I cannot but share the name of Ignat Kaneff, one known too well to the locals. In short, he is born in a village near Rousse to poor parents as one of their 7 children. After leaving Bulgaria first for Austria and then for Canada, he is now the owner of a billion dollar construction business. At 89 he is known in Rousse as a major University benefactor. He donated USD 1,5 million, which was used to build a state-of-the-art conference hall named after him and opened in 2014. Well, I am humbled by such a deed and my heart is filled with hope. As long as there are people who are rich enough not to care about education and still do, I agree we can all do better. If you are further interested in this topic, here is some detailed information about Angel Kanchev, University of Rousse, RuseConf, Kaneff Centre, and Ignat Kaneff.